The words Feng Shui in Chinese literally means Wind and Water. In Asia, it is popularly called Geomancy. And a practitioner is known as a Geomancer. Geomancy emcompass not only Feng Shui but also the various other Chinese divinity methods. Do we really need to travel back to 5000 years ago for getting into the history of Feng Shui? To date, many websites, articles and books capturing different dates as to the origin of Feng Shui, various from 2000, 2500, 3000 years. There is even been a claim saying that Feng Shui is originated in China 5000 years ago, really? Does Feng Shui really exist in 5000 years ago? I don’t know, but, the fact is, human being start using it without knowing it by choosing a place to live in the ancient time. In we could link the Feng Shui practice back then, we know that in 28,000 years ago, Neanderthal cavemen (located in present-day Croatia) chose which caves to live in based on three criteria: higher ground, cave, and water. The caveman would choose a higher ground in the area, with surrounding area was easily seen from the entrance of the cave, and also easy access to water source. No doubt, this show that even our ancestors were aware of the effects of the environment, and linked to the essential principles of Feng Shui. Let’s us now going into the 5 Ws..
Of course, the answer is CHINA, where else could that be? Basically, Feng Shui was formed in China, and it was suppressed in mainland China during the Cultural Revolution in the 1960ss, as China open their door, Feng Shui then has increased in the popularity. Like a winds, Feng Shui travel fast and furious, many western countries such as Germany, Russia, United States, Australia, South Africa, more and more countries started practicing this ancient knowledge. We cannot really give the date of birth to define when does Feng Shui started? Indeed, it is also not possible to trace WHOdeveloped Feng Shui in the first place. It is not as simple as a mother give birth to a child, and named the child as “Feng Shui”. However, in Chinese mythology, it was The Mysterious Lady of the Ninth Heaven 九天玄女, a female deity introduced the Feng Shui. Let’s leave that untouched as a myth. There is practice of Feng Shui during the Warring States Period 战国时代, also known as the Era of Warring States, covers the period from 475 BC to the unification of China under the Qin Dynasty in 221 BC. In fact, Feng Shui was not the origin term in the ancient time, it was known as the art of ‘Kan Yu堪舆’, the first word to describe Feng Shui in the Tang Dynast唐朝 (around 1000 years ago). It was described as the observation of the forces between heaven and earth. During the time period, Feng Shui is a study based on the principles between Yin and Yang, Five Elements and Eight Trigram BaGua 八卦. The word Feng Shui was a later development derived mainly influenced by the Book of Burial 葬书 written by Guo Pu 郭璞 (AD 276—324). In the Book of Burial, which less than 2000 words, it says: “Qi rides and scatters with the Wind (Feng 风); (and) gathers at the boundaries of Water (Shui 水) –in Chinese writing: 气乘风则散, 界水则止.The term ‘Feng Shui’ was came into being towards the end of Qing Dynasty 清朝 and widely used until today. WHAT is Feng Shui 风水.Feng Shui is not a religion, it got nothing to with religion. The term Feng Shui literally translates as “wind-water” in English, and it has deeper meaning than just wind and water. As Albert Einstein discovered energy, we know that we are surrounding by energy all the time, and if we go deeper into it, we will discover that everything on this planet is a form of energy. We send our thoughts out to the universe, and it expand and transmit through vibrational form as energy. This life force energy is a natural phenomenon of the living environment, with our Mother Nature which we called it “Qi” 气 (pronounced as ‘chee’) in Feng Shui. It is an invisible life force energy that we don’t see it with our naked eyes, yet we know it does exist, and brings life to all beings. Qi is the core of Feng Shui. In Feng Shui, we are study the Qi or life force energy of the environment surroundings us, understanding the quality of the Qi, harness the Qi and tap into it to enhance and improve our living and lives. I will explain more about Qi in next time, let’s call it “It is all about the Qi”. NOT a quick fix, and not a miracle cure. NOT an Interior Design or Art of Placement, place your furniture or painting the wall. It not the above, WHY Feng Shui? Mencius was a Chinese philosopher who is the most famous Confucian, who once remarked 《孟子·尽心上》：“居移气，养移体” – (Mencius.Jin Xin I) Refers to the position and the environment that can change the course of human temperament, on instructions from the human body can change. In short, the surrounding energy of an environment will affect human well being. Everything on earth, plants, animals, people and things exists in a vast landscape that swirls with vital energy. The energy is circulate everywhere, the same energy flow through the world flow through you as well. Therefore, it is no doubt that we are affected or influence by the environment energy we are living on. We are just a small coordinate in this world, living with our Mother Nature. It is such important for us to understand our environment energy, positioning and tapping into the Qi to enhance conditions for success in life. As you begin to discover more about Feng Shui, I urge you to stay open minded and align with the universal principles of energy flow by planets spin in the orbits and galaxy. If we applied correctly, it is one of the powerful improvement tool in our life! It has been proven that with applying Feng Shui, you will be able to harness the Qi in your environment in order to achieve a certain goal. Now that you understand what Feng Shui truly is, or perhaps you have read articles somewhere, you may see many different application of the Feng Shui, such as San Yuan (三元), San He (三合), Flying Stars (飛星), Eight Mansions (八宅) and etc. Perhaps you have heard of the Form School and Compass School, so which is which? 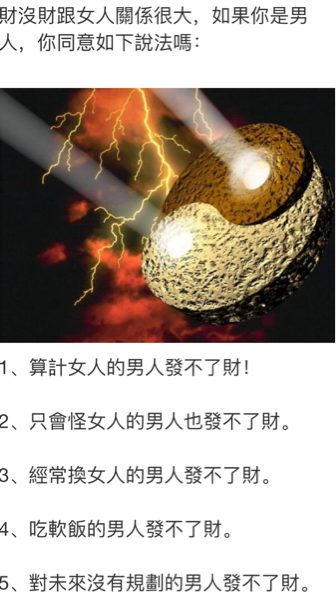 When Feng Shui was first used back in the ancient days, it was the study of the Earth, focusing on the Landform (巒頭 Luan Tou) assessing the Qi of external natural landform of the area such as mountains and water. Later, Li Qi (理氣) methods were introduced that was based on the calculation and formula to ascertain the quality of the Qi at a given time and location. Feng Shui basically can be categorized into Two Schools, San He (三合) and San Yuan (三元). San He is working with landforms, the appearance of the surrounding environment, physiognomy, characteristics and forms and how they could influence the lives of those living in the vicinity. San Yuan is based on the formula and calculations in the aspects of time and how it affects your Feng Shui. It is an idea that Feng Shui practitioner can predict the events and outcomes of the residents through logically deductible mathematical formulae. It is a dynamic view of Feng Shui, and the energies in the environment that will change every 20 year cycles, as you may hear that we are in Period 8 now, next circle Period 9 start in year 2024. It is also known as Annual Flying Star circular the energy every year. Formulas are used to qualify Sheng Qi 生氣 and Sha Qi 煞氣. Every formula is supported by physical forms, therefore External forms take precedence over formulas. In short, ALL formulas (Flying Stars or Eight Mansions) have to be ‘matched’ to and supported by physical forms. Which is better? San He and San Yuan? It is best if we can get the external form environment in a good shape before apply to any formula, however, not everyone will be lucky to have it. So, it is best to incorporate both, and fully utilize it. Remember, focus on what you have rather than what you do not have. You first need to have it before you can use it, so, use what you already have with you, to create what you want to have, that should be the way. Tracing the root: Five Arts of Chinese MetaphysicsJust like back to the school day, every time when we are learning a subject, we are always back to the basic, to trace the root of the source. Before we proceed to the Five Ws (When, Where, What, Who, Why), let us start with understanding Feng Shui is one of the category with in Five Arts of Chinese Metaphysics. Yes, it is 5 again! 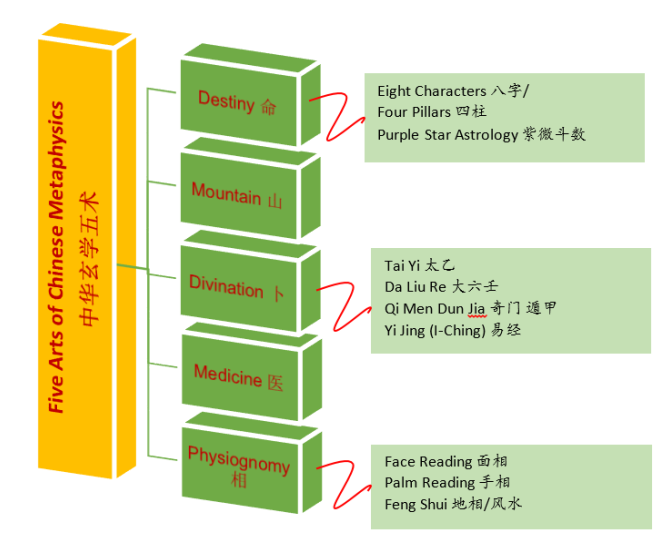 Five Arts of Chinese Metaphysics中华玄学五术 are Medicine 医, Mountain 山, Divination 卜, Destiny 命 and Physiognomy 相. So, what do you think Feng Shui fall into which category? My answer was Mountain 山 and I got it wrong! I was wrong because being a Chinese, I have the impression that Feng Shui is about Mountain 山. Set that aside, the answer is Physiognomy 相. Feng Shui falls under physiognomy – the observation of appearance. Face Reading and Palm Reading also fall under this physiognomy art. Feng Shui a study of the physiognomy of the land, and how we can harness any prevalent Qi towards improving our living conditions. By observing the physiognomy of the land, house location and environment, one can foretell the fortune of the house and its residents, occupants. Medicine 医: study of traditional Chinese medicine which includes acupuncture, herbology and medical prescriptions. A well-known book written is The Yellow Emperor’s Classic of Internal Medicine 黄帝内经. Traditional Chinese medicine is based on the concept of Yi Jing, Yin and Yang, and Five Elements. Mountain 山: Philosophical art, cultivation, martial arts, self-healing, meditation which covers the thoughts and teaching of Ancient Chinese philosophers or sages. This is also include the study of, whereby in the ancient time, one will need to go up to the mountain to receive such knowledge through meditation or cultivation. Taoist Sorcery, Taoist Rituals and Taoist Talismans belongs to this. Divination 卜: Yi Jing 易经 (I-Ching) being the most popular study in this art, other includes Tai Yi太乙, Da Liu Re大六壬, and Qi Men Dun Jia奇门遁甲. They rely on numerical analysis to reveal one’s part and future, to predict the outcome of incidents and events. Destiny 命: Study of the destiny or fate, several methods of assessment are used and this includes Chinese Astrology systems like Eight Characters or 八字 or Four Pillars 四柱, and Purple Star Astrology 紫微斗数. Physiognomy 相: It is about the appearance, Face Reading面相, Palm Reading手相 (hand form) and of course, Feng Shui 地相/风水which about the study of form of the environment.